Robotic Gynecologic Surgery for Women now performed by Dr. David Agorvor & Dr. Braithwaite of Women & Teens Healthcare in North Miami Beach at major hospitals. Dr. Braithwaite has worked with Dr. Agorvor at Women & Teens Healthcare for over 8 years and he highly recommend all the patients to Dr. Agorvor because he is a very knowledgeable, dedicated and skillful obstetrician gynecologist with excellent bedside manners who cares about the well being of his patients. Both Doctors have taken the lead in providing women with the most effective and technologically advanced solutions available in healthcare for women. Compared to traditional surgery, robotic surgery is usually more expensive. Allow us to explain you why. A single robot costs about $2 million. The system has an annual service contract requiring between $100,000 - $170,000 (in addition to the purchase price). These rates justify the higher price of the robotic surgery compared to laparoscopic surgery or open surgery. What are the Benefits of Robotic Surgery for Women? Fewer complications, including less risk of infection. Robotic surgery is a type of minimally invasive surgery. “Minimally invasive” means that instead of operating on patients through large incisions, we use miniaturized surgical instruments that fit through a series of quarter-inch incisions. Procedures that once required large incisions and a long recovery, including hysterectomy can now be performed robotically. Why Robotic surgery is used? Robotic surgery is usually associated with minimally invasive surgery — procedures performed through tiny incisions. It is also sometimes used in certain traditional open surgical procedures. Most robot-assisted surgeries use the state-of-the-art da Vinci surgical system, which is designed to help the surgeon perform procedures with unmatched precision and control, and only a few small incisions. Other advantages for the surgeon include increased range of motion, improved dexterity, enhanced visualization and improved access. These attributes allow surgeons to perform more complex surgical procedures than can be accomplished by traditional laparoscopic surgery. With traditional laparoscopic surgery, several incisions are made and thin instruments, along with a video camera attached to a telescope, are inserted through the incisions. The camera transmits an image of the internal organs onto a television monitor and the surgeon uses the image as guide. Robot-assisted surgery is a laparoscopic procedure with an added layer of technology that offers better visualization of the anatomy, which is especially critical when working around delicate and confined structures like the bladder. Robot-assisted surgery is performed through tiny incisions of one to two centimeters that cause minimal impact to the surrounding area. Patients are often able to go home after a very short stay in the hospital, and many women report little or no significant pain after surgery. The faster recovery time allows them to get back on their feet and back to their daily activities sooner, often in a matter of days. Robotic hysterectomy surgery removes all or part of a woman’s uterus. The fallopian tubes and ovaries are also sometimes removed. Hysterectomy may be recommended for conditions including uterine or cervical cancer, uterine fibroids, menstrual disorders or severe endometriosis. What is a Endometriosis resection? Endometriosis is a condition where the uterine lining is present in other pelvic organs, causing painful menstruation and the formation of cysts, lesions and adhesion. Endometriosis resection removes the abnormal tissue through small incisions to relieve symptoms. The surgical removal of one or both ovaries is a common treatment option for women with ovarian cancer, ovarian cysts or other ovarian abnormalities. What is a Pelvic organ prolapse repair? Pelvic organ prolapse occurs when the natural tissue and ligaments that hold the pelvic structure in place begin to fail. Surgery can reposition organs in the pelvic cavity. Firstly, many conditions affecting the uterus are treated with a hysterectomy, which is the surgical removal of the uterus. A hysterectomy is often the preferred treatment for symptoms such as chronic pain and bleeding, but it is also used for treatment of life-threatening conditions, such as cancer or uncontrollable bleeding in the uterus. What is a robot-assisted hysterectomy, and what are some common questions and answers regarding robot-assisted hysterectomies. What is a robot-assisted hysterectomy? Traditional open gynecologic surgery typically requires a large incision for access to the uterus and the surrounding anatomy. However, with open surgery, patients often experience more pain and a longer recovery, compared to less invasive surgery. All minimally invasive surgical procedures require fewer, or smaller, incisions. But robotic hysterectomy is different from laparoscopic hysterectomy. It uses robotic technology to increase precision and control. During robotic hysterectomy, surgical instruments (and a tiny camera) are attached to robotic arms. These arms are controlled by a specially trained surgeon from a nearby computer console. As your surgeon moves his or her hand, wrist and fingers, the robotic arms perform the same movements in real time. Not only do the robotic arms mimic delicate movements, they can bend and rotate in ways a human hand cannot. The computer console also displays a high-definition, close-up view of the surgical site. Throughout the procedure, your surgeon can see inside your body in three dimensions. This is another key difference – during laparoscopic hysterectomy, surgeons only have a two-dimensional view of the surgical field. How long does it take to recover from robotic hysterectomy? In most cases, women who have a robot-assisted hysterectomy can return home the day after surgery. You may be able to resume normal activity within two to three weeks. In comparison, women who have an abdominal hysterectomy may need to stay in the hospital for several days following their procedure. And recovery can take six to eight weeks. Everyone recovers differently following surgery. Your recovery time will depend on several factors, including your age, overall health and the type of hysterectomy you had. Is robotic hysterectomy covered by insurance? It’s important to check with your health plan before having any surgical procedure. Many, but not all, insurance companies cover robotic surgery (including robotic hysterectomy). 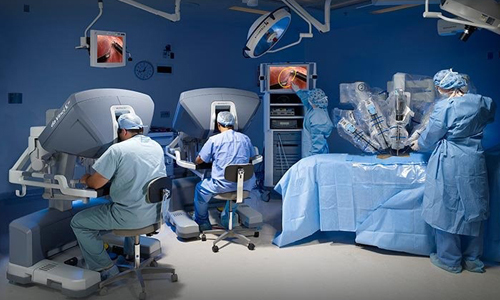 Those that do cover robotic surgery often categorize it as “robot-assisted minimally invasive surgery.” In most cases, if your plan covers minimally invasive surgery, it will also cover robot-assisted surgical procedures. Risks vs.Rewards. While robotic surgery is considered generally safe, the FDA is reviewing the data after a growing number of reports of related complications. ... Still, surgeons see many advantages to performing procedures with a robot.